When I try to make my normal walk from my office at the Chase Tower around the Northcross triangle, I can’t. There is a metal fence with a plain green cloth stretched from the middle of the parking lot all the way to Anderson. I can’t see what is happening except through holes where the cloth doesn’t fit quite tightly enough to exclude me. I do see Sandy’s Shoes at its new location if I go around by Conn’s. I see some other businesses, like Go Dance, still going strong. I see a new look at Thundercloud Subs. I see continued growth in the Northcross IBIZ District that celebrates the uniqueness of our locally owned and operated businesses. There are new banners hung on light poles and a new feeling of pride. And, that is good. I hear from some of the other neighbor businesses that the time has come – just like the Walrus said in Alice in Wonderland. WalMart is going in. We hope it will be a good business neighbor but we don’t know. And, we wonder, will all the good relationships we developed with people from the neighborhoods continue? We all hope so. Will they continue to come in and buy? We need it or our “true center of Austin”, the Northcross IBIZ slogan, will just become a place to drive through as quickly as possible. Or worse, it’ll become just a place to get cheap stuff with no heart, no soul, and no identity. Every neighbor can help. And the price and the people are right. So, think first, then buy. Before you go to a big box store to have that key made or buy that battery or air filter, see what Zinger Hardware has to offer besides beautiful furniture and plants. Before you buy a gift for your child or sweetheart online, look at the fun stuff at Kids-N- Cats and Terra Toys, or make something at Sea of Beads. You might even find just the right “house gift” at Lamps & Accessories, Urban Living, or Scandinavia Contemporary Design. Before you sign up for that pre-portioned diet food, see what Body Business or Yoga Yoga can do to make 2010 a healthier year and a healthier you. Garbo, a salon, is another Northcross favorite. And don’t forget to relax at our own neighborhood theatre, Alamo Drafthouse, or skate your troubles away at Chapparal Ice. Before you buy that computer or cord at a non-profit or national store, see what Discount Electronics has in stock and get great answers to tough tech questions. Tell them you appreciate their efforts to help us keep a neighbor-friendly atmosphere where driving is easier and walking or bicycling is safe. Before you buy that cheap CD, go hear unique sounds at Encore Records & Video. Ask Charles to tell you about his early days in West Texas and all the music greats he rode to school with on their motorcycles. Keep the creative juices flowing, the inspiration going along with keeping the stories alive. You’ll learn a lot. Before you buy that cup of coffee or soda at that chain, think how good local tastes and how much it matters to us all, not just the owners of Genuine Joe’s and Thunderbird. Any purchase, every purchase is more than just the “thing” you bought – it has a life and a history and people behind it. The local stores and their owners and employees share your community. They have been here with you through the fight to get a WalMart more in size and perspective; to get a big box store that is also in keeping with our united community vision instead of an imposed superstore that reduces us to just any other residential area with few local stores to call our own. You gave your time and money and they gave just to make a difference. Don’t forget. I know you will buy from chains and big boxes and other places outside our five neighborhood area. But, keep some of your money doing good at home. Shifting just 10% of your shopping from chain stores to locally owned businesses annually, adds $244 million to our local economy creating 2,855 new jobs. And supports a sustainable local economy for us all! If you check out what is offered locally, you may not buy but you will have looked. You will have made an effort and surprise, surprise you will find local business that have better stuff at a better or comparable price than what you thought you could only get at a giant. Give it a try. 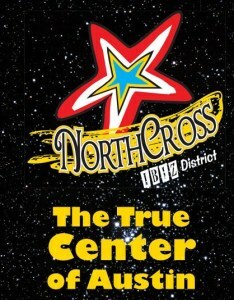 Download the Northcross map or any of maps of the other IBIZ Districts in Austin. (Currently there are six.) Then tell me what wonderful purchases you made by making the choice to buy local, not global. Be sure to name the store or business so we can support them and keep “buying local” a neighborly and economically smart thing to do. I was the Chair of the Business Liaison Committee for Responsible Growth for Northcross, As a business owner, neighborhood resident and as one who got to know a lot of these owners, I just want to thank all those businesses who participated in our efforts. You made a difference for yourselves, for your customers, and for our future. You’ll be seeing me soon in your store or buying your service. I was thinking about the places I take people to when they’re here: Book People, Fonda San Miguel, Magnolia Cafe, Electric Ladyland, Toy Joy, Vino Vino, Hyde Park Theater, Vespaio… These are the places that make Austin what it is. Walmart may create some jobs, but it erodes the very soul of our city. The more the big boxes we have, the less unique we are. Already there are too many stretches of highway in Austin that have become “Anywhere, USA”. The fact that shifting just 10% of our buying makes such a big difference kind of blows me away. We need to spread that word – it’s great incentive to make a conscious effort to change our habits just a little. It is about time that a majority of the people will finally have a local Walmart. Shame on all the minority special interests groups that blocked the development for so long. 2012 UPDATE: Roy got his WalMart, one mile away from another one. We lost our status as an IBIZ District and what you see is a food court of franchises at Northcross. Not exactly the plethora of independents that those for it said would be there. There’s no shame in trying to keep a neighborhood diverse and protecting the environment from the runoff and trash that comes with a big box. There is a now a IBIZ District, Lo-Burn in the lower Burnet Rd. area at 45th street. There are some great locally owned and operated stores there including Upper Crust Bakery, Bark & Purr, and Lauderstein Conway Massage School.